How Are You Watching Breaking Bad Tonight? 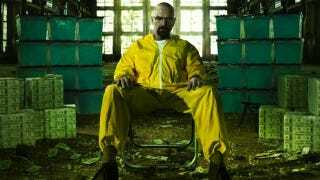 Now that Mad Men and Game of Thrones have unknotted their ties and sheathed their swords for the year, TV junkies are turning to the ever-stellar Breaking Bad, which premieres tonight. If you're watching, will it even be on a TV? You've got three good options: watch it live (Twitter commentary! ), DVR it (convenience! ), or just torrent the thing (!). What'll it be?